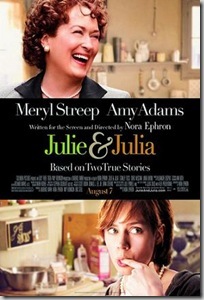 I saw “Julie & Julia” yesterday, after finishing the book a week ago. I laughed and cried through the whole thing. What a delightful movie. I look forward to seeing it again on DVD; I hope you pack it full of special features! The reason I’m writing is that I heard you being interviewed on NPR a couple of days ago, and you and the host were talking about all the butter. You said something about, who knows, maybe someday there’ll be a big headline telling us that butter isn’t so bad for us after all. Human beings evolved eating animal fat, and until the early part of the last century, that was what everyone in the U.S. ate and cooked with, and we weren’t dying of heart disease or diabetes. Bad science and worse journalism scared many people away from saturated fat and cholesterol, whereas they are not only not harmful, they are essential to human health. Most of what you find in the popular press—or the doctor’s office—is way behind the scientific curve. Enclosed please find a sample article by Sally Fallon and her collaborator, Mary Enig, PhD, one of the world’s foremost lipid biochemists. 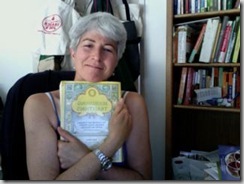 They are the co-authors of Nourishing Traditions and Eat Fat, Lose Fat. I wish you continued good health and happy eating, with lots of butter! Also read Jeanmarie’s amazing movie review of the Food, Inc.
Jeanmarie Todd is a former health-care industry and science editor for Bloomberg News. She currently lives on a farm in Mendocino County, California, with three dogs, two cats (the third went feral) and billions of friendly microorganisms in the kombucha, kefir and lacto-fermented vegetable cultures that share her home. Jeanmarie with her cookbook collection.